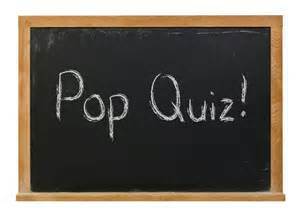 Merriam-Webster defines pop quiz as “a short test that a teacher gives to students without warning”. As a student, I hated pop quizzes. When the teacher said the words “pop quiz” my mouth would become dry, my palms would begin to sweat, butterflies would take flight in my stomach, and my heart rate would accelerate. I wanted to be in control and know the plan ahead of time. I didn’t like surprises. Not only do teachers give pop quizzes but life does as well – the car accident, the unexpected diagnosis, the job loss, the financial setback – and the list could go on and on. Pop quizzes may be a common occurrence in the classroom and in life in general but did you ever think about pop quizzes in you spiritual life? I have discovered that when God reveals a new truth to me from His Word, it is often followed by a pop quiz! I was participating in a Bible Study at my church and the topic the previous night had been obedience. The facilitator had emphasized that obedience was reflected not only in our words, but more importantly, in our actions. I pondered those thoughts in my quiet time the next morning and then headed off to the mall to complete my Christmas shopping. My ‘to do” list was a mile long. As I approached the entrance to the mall I saw someone standing off to the side. Coming closer I saw that it was one of the young women who worked at the nail spa where I occasionally went for a pedicure. I could see that she was upset. In fact, I saw that she was sobbing and tears were streaming down her face. As I hurried by I wondered what had happened to make her so upset. All of a sudden, as I passed through the mall doors, it was as if I had run into a brick wall, and, although not audible, I could clearly hear God speaking to me. It went something like this. God: “Kay, what is more important, taking the risk of being thought you are weird or being obedient? I stood there a few more seconds, then turned around and went back through the double doors. I walked over to the young woman and asked her if she was alright and if there was anything I could do. She shook her head no. I gave her a hug and walked away. This pop quiz was about obedience and I almost failed. I just wish I had said more about the God who prompted me to act. Jesus is the ultimate example of obedience. Jesus was totally obedient to his Father’s will. Jesus demonstrated obedience in his relationships. As believers we should follow Jesus’ example of obedience. Obedience is a Christian principle that all of us have struggled with at times and may require us to step out of our comfort zone but the results are worthwhile. Greg Barber has said “Obedience doesn’t make God love you more, but it does show that you love God. Truth to claim: Obedience is a demonstration of our love for God. Application: Determine to be obedient to God whatever choice you face. Sometimes obedience may be all you have to give, but my experience is that you get more than the act required.